Over the last few years there have been many innovative advancements in the way food is stored. Food is an essential part of life and it’s important to store it in ways that keep our families safe from food born viruses or bacteria. One way of storing food that is often overlooked is vacuum sealing it. It actually makes sense as you can purchase some foods like coffee already stored in vacuum packaging because it removes the air and keeps it fresh until ready to use. 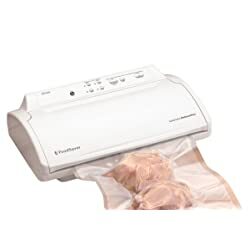 A vacuum sealer is a device that uses a heat sealer to create a package that is air tight. The sealer is a good alternative for storing items that typically break down when they come in contact with air. The device is able to remove the air from inside a bag and then apply heat to create a tight seal so no air can go in or out of the sealed bag. Once the air has been removed and the bag is sealed the food is protected. The bags that are used with a sealer are specially designed to melt at just the right level so they don’t melt but instead take and hold a seal. Many people may pose the question as to why they need a vacuum sealer to store food at home. The truth is that there are many benefits to using a vacuum sealer for home food storage. One of the biggest reasons you need a vacuum sealer is to prevent wasting food. When you use more of your food without throwing so much out, you are ultimately saving money as well. These are actually two of the primary reasons to make the purchase or investment in a healthy, economical kitchen. 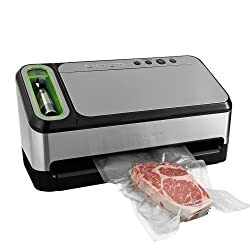 A vacuum sealer is a small device that is used to package foods or other items by removing all the air. Exposure to air is the number one reason behind food spoilage. If you can take air out of the equation – then foods will stay fresh longer and last longer. Can I really save money? You absolutely can save a substantial amount of money by purchasing a vacuum sealer. Actually, in no time at all you’ll save the small amount you paid for this convenient gadget. The first way to save money has already been discussed and that is through reducing the amount of food you waste through improper storage options. The second way is that you can now purchase many items for lower prices when you buy them in bulk. For example, you can purchase boneless chicken breasts in small packages for a certain price. But if you buy it in a large package you can save a large amount of money by getting more pounds at a cheaper by-the-pound price. You’ll be able to do this because you now have a way to break the package up into meal sized bags and store them safely. Then all you have to do is take out enough for a single meal when you are ready to use it. Are there other foods that I can save money by using the sealer for? Yes. Meat is a more expensive type of food and you can save money by buying it in bulk. But you can also save lettuce by using the vacuum sealed bags. If you buy a package of three Romaine lettuce heads you can seal two of them in an air tight bag and keep them fresh a lot longer than just keeping them in the crisper. Cheese can also be stored in an air tight bag so it doesn’t mold. Once cheese is stored in an air tight bag it can last for weeks in the fridge. 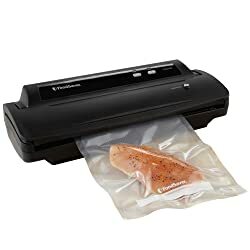 Having a vacuum sealer can mean you make fewer trips to the grocery store. Remember that you are buying the sealer to help save on food and so you don’t waste as much food. That means you don’t have to go to the store quite as often. You can also marinate foods in a matter of a few minutes instead of making hours of preparations. Many sealers have a quick marinator feature that helps create tender veggies, fish, or meat in a matter of about 15 minutes. Meals can be cooked ahead of time and sealed in bags for easy preparation. You can literally prepare meals a month or a week in advance, seal them in a bag and freeze them to use whenever you are ready to eat them. Do you use steamer bags for your veggies? The vacuum sealer can be used to make the same thing. Stock up on veggies when they are in season or on sale and then freeze them in the size of bags you want. The bags have a built-in steam vent so they can go from the freezer to the microwave or a pot of boiling water in a matter of minutes. The freezer or pantry can be better organized by using vacuum sealed bags. They are easy to stack on top of each other to help keep things organized and neat. Food will maintain its freshness 3-5 times longer than other storage methods because it is not exposed to oxygen. This lack of oxygen also eliminates all signs of freezer burns. BONUS: You can download the infographic here. There are several types of vacuum sealers available on the market. A countertop model is the most popular choice as it sits nicely on the cabinet and can be stored out of the way. There are also portable and handheld models to choose from. There are two basic types of vacuum sealers, external vacuum and chamber vacuum sealers. A chamber vacuum removes the air from the chamber as it removes air from the bag which is then sealed so that it is not exposed to any air. An external vacuum sealer takes the air out of the bag only. A chamber sealer is typically used only in a commercial setting while external vacuum sealers are more than adequate for use in the home. 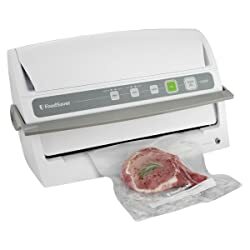 Both types of vacuum sealers can help keep foods fresh for longer periods of time and help provide options for storing foods to help preserve them longer. Each type can end up saving you money in the long run. In many cases you will want to purchase some accessories to go along with the unit. It makes sense that you will be buying the bags needed for the unit, just make sure to buy the ones that are compatible with the model of sealer you have. If you purchase a model that uses heat to seal the bag off, then you will also need to make sure to purchase bags that are heat safe. Other accessories that you might want include storage containers and equipment needed to store foods in them properly. You will also need vacuum sealed bags and hoses if you want to use canisters. Use it for Food Storage – The main reason someone buys a vacuum sealer to begin with is to use it to store food. It can be used to store fresh foods that have been dried or frozen. Many different types of fresh produce like peas, strawberries, peppers and green beans can be laid out on a cookie sheet to be frozen and then safely sealed using the vacuum sealer to preserve their freshness and flavor. It is also a great solution for managing leftovers. They can be packaged into perfectly sized portions to be quickly reused on a busy day. The air tight bags stack nicely in the freezer so they do not take up a lot of space. It can also be used to store bulk dry goods and extend their shelf life. Use it to Reseal oil, Vinegar or Wine – After you break the seal on many commonly used liquids their shelf life can drop drastically, especially wines. Today some vacuum sealers have a special attachment that allows you to reseal bottles. Use it to Prevent Corrosion – Basically anything can be put in a vacuum sealed bag. Things like ammunition, fine silver and other metals can have a tendency to corrode and tarnish over time. The vacuum sealer can be used to keep your silverware nice and shiny. You need to wrap silver cutlery with thick paper or cloth to keep them from poking a hole in the bag and defeating your purpose. Welders have found a vacuum sealer to be very beneficial since they can keep their cutting rods and welding electrodes in air tight containers so they are not exposed to the elements. Use it to store Emergency Supplies – Almost anything you want to keep dry can be stored using the vacuum sealer. First aid supplies can be kept dry and ready to use by sealing them in an airtight container. Matches, flint, even toothpicks can be stored so they are safe, sanitary and ready to go when needed. You can make your own premade meals for camping or preserve important documents with them. Use it to Reseal Food Containers – Once a bag of chips or a box of crackers are opened, the contents immediately start to get stale. But you can use the sealer to reseal the box or bag, or its contents so that the food doesn’t become stale or dry out. It’s also useful to seal items like chips, crackers and nuts so that the contents do not spill all over the cabinets. They are also useful for packaging out all your bulk foods into manageable sizes as well as keeping things like spices from going stale before you get a chance to use them up. The V2244 has everything you need to enjoy vacuum packing your own foods. One of the key features of this one is its compact size. It is also manually operated so it is easy to use. The manual sealing system is simplified and is as easy as filling the bag and placing it on the sealing channel, closing and locking the lid and then pushing the button which activates the vacuum seal. It comes with a special “CrushFree Instant Seal” that helps when you are packaging more delicate foods and it ensures they are not crushed in the preserving process. This product includes an accessory port so that you can use the specially designed hose to seal canisters or to marinate food in a matter of a few minutes. This model is super easy when it comes to clean up and the drip tray is removable and dishwasher safe. The Seal-a-Meal vacuum sealing system is a great asset to any modern kitchen. It is a very compact model which is easy to use and easy to clean. This is a hands-free model so it does all the work and you don’t have to. It has a seal indicator light so you know when it is sealing and that the seal is good. There are just three simple and easy steps to sealing your items in the bags. First you place the filled bag on the sealer strip, then lower the lid. Gently, but firmly press down equally as hard on both ends of the lid until the “hands-free’ indicator light comes on. Once it has successfully sealed the bag, you will hear the motor stop and the indicator light will go off too. After the light goes off, press the button again to raise the lid and remove your sealed bag. It really is that simple! The Seal-a-Meal has a drip tray that can be totally removed and cleaned easily. This model can handle a variety of bag sizes including 8-inch, 11-inch, quart size, gallon size and rolls. The FoodSaver V3240 comes with a convenient starter kit which includes 3 quart-sized heat-seal bags and 2 gallon heat-seal bags. It has two different vacuum speeds and is an all manual operation. The two settings allow for storing both moist and dry foods. It’s designed to keep foods safe during the sealing process so that they are not crushed while their flavors are being preserved. The roll holder can be loaded with sealer bags to make the progress much easier and the sealing strip is wide enough to apply heat for a secure seal that locks in the flavors and freshness. The drip tray can also be removed and placed in the dishwasher or easily washed by hand. It comes with a handy hose that fits the accessory port so it can be used with a variety of FoodSaver canisters and containers. This is a small but powerful food sealer. It is easy to use and is a special hands-free model to make it even easier. The unit is designed to include an on-board bag storage so vacuum bags are always easily accessible. It also has an on-unit cutting blade which helps detach the bag once a proper seal has been attained. The GameSaver is designed to be smaller than most other similar units so that it saves a good amount of space in the kitchen. The body of the machine is made using crushfree technology so it is durable and long lasting. It comes with both manual and automatic operation settings. Dry and moist foods can be stored using this FoodSaver. This is a special FoodSaver starter kit so it comes with several supplies and bags. It has a slot to store more bags and is equipped with a bag cutter. One of the primary features of this high quality unit is its handheld sealer. This unique feature makes it a lot easier to seal a large variety of options such as zipper bags, containers and canisters. The hand-held unit is also retractable so that is conveniently stores when it is not in use. This model can seal containers with dry or moist foods and has a removable drip tray drawer which is easily cleaned and replaced. 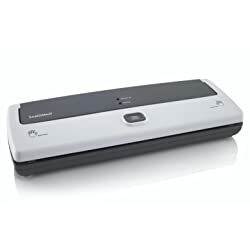 The prices of a vacuum sealer can vary greatly based on the different features, brand and size of the unit being purchased. There is no guarantee of higher quality just because there’s a higher price tag either. It’s better to know exactly what you are looking or so you can get the right sealer to meet your needs and so you an budget appropriately. Here are a few of the things to consider when looking for a vacuum sealer. What types of features does it have? There are a few very simple vacuum sealers that just seal a bag. But there are others that have attachments that make it possible to reseal bottles or air seal containers too. Think about how the sealer is going to be used and think about all the features you want included. Do you want one with automatic controls, manual controls or both? You’ll probably want one that cuts the bag automatically and maybe one that starts to seal automatically when the bag is placed into the opening. How large of a unit do you want? Sealers come in a lot of different sizes and if your kitchen is challenged as far as available storage space goes you might want to purchase a smaller sized device. They come in a lot of different sizes which can accommodate the space available in any kitchen. How much do bags cost? If you are using bags for storing raw meat, you’ll have to buy bags rather than reuse them. In some cases, bags can be washed and reused. You may need to invest in a few different sizes of bags so you can use them for a variety of storage options. The main thing is to purchase bags that are compatible with the brand of sealer you are using. Do you want a portable unit? Not only are food sealers good for use at home, they can be very handy to take with you. It can be very useful when doing activities such as camping or traveling. There are larger units designed for today’s modern kitchen as well as smaller handheld units that are convenient for those on the go. Does it get good reviews? Today there are many reviews about most of the popular products. These let you have a good view of the product before you lay out your money for the purchase. Reading reviews can help you find the sealer that is the perfect fit to serve your most pressing needs. They also alert you to the types of features the sealer has and makes the purchase process a whole lot easier. What type of warranty and maintenance does it have? Most of the vacuum sealers are durable and are built to last. However, there are a few times when they need maintenance or even some replacement parts. Most of your high quality food sealers will have a very good warranty backed by a company that offers great customer service. As with any type of appliance, a vacuum sealer will need periodic cleaning. Usually all you will need to do is to wipe it off with warm wet cloth. It will need to be cleaned after every use since bacteria can build up over time and each time you use it you should start with a clean unit. The instruction manual that comes with the unit will contain specific instructions on what your specific unit needs. Many models have a removable drip tray that can be placed in the dishwasher or hand washed after each use. If your model has gaskets, they will usually need to be cleaned every 3 to 6 months and need to be replaced at least once a year to keep the unit working properly. Portable units or those which are battery operated will need to have the batteries replaced periodically or need to have the battery’s charged on a regular basis. As you can see there are many very good reasons to purchase a vacuum sealer. They can save you time and money and help you preserve food for future use. There are also different sealers with different features. Use this guide to help you select the best one for your personal kitchen use.